Azio has unveiled a new Bluetooth edition of its popular Retro Classic keyboard, which joins the pre-existing USB wired variant. The Azio Retro Classic keyboard's design is based on vintage typewriters and features a genuine leather, wood and metal build. 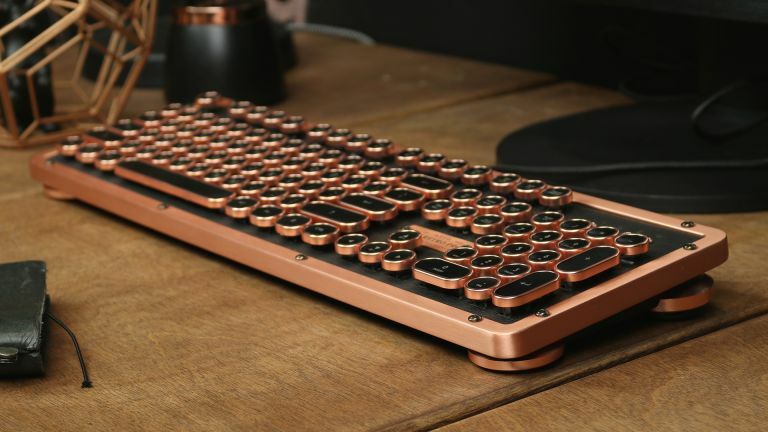 The Azio Retro Classic keyboard also comes equipped with mechanical switches, a Zinc alloy frame, and is backlit, too. Circular keycaps sit over a genuine leather surface. The mechanical keys of the Azio Retro Classic keyboard are tuned to be tactile and "clicky", thereby evoking the sound and action of an old fashioned manual typewriter. Charging for the Bluetooth version of the Azio Retro Classic comes courtesy of a rear-mounted Type-C USB port, which supplies juice to a massive 6,000 mAh Lithium Ion rechargeable battery. Battery life rests at over a year per charge with the backlight turned off, or between one and two months with it turned on, depending on its intensity setting. 17.9 x 1.6 x 5.8 in / 455 x 147 x 40 mm and it weighs in at 3.5 lbs / 1587 grams. The Azio Retro Classic range of keyboards is available in four styles, Onyx, Posh, Artisan, and Elwood (as shown in the above image). The wireless Bluetooth editions cost $219.99, while the wired USB versions ring in at $189.99. More information about the Azio Retro Classic range can be found on Azio's official website.